A selection of System 100M modules, seen in the synth collection of the boss of Mute Records, Daniel Miller, in 1998. And yes... he's still the boss! This month, we'll see how Roland survived some tricky times at the start of the 1980s, and how founder Ikutaro Kakehashi ensured that they were well placed to take advantage of technological developments over the following few years. In the first part of this history, I described the history of Roland from their inception in 1972 through to 1978, a year in which everything was looking rosy for Ikutaro Kakehashi and his team. Sales were growing, and, with a string of world 'firsts' under its belt, the company had gained respect throughout the music industry. By the end of 1978, no fewer than 120 products graced the company's portfolio, and although some of these did not appear in the UK until the next year, this was a remarkable achievement for a business formed with no premises and limited capital. And for over a year after that, the impressive achievements kept on coming, before the company hit a rocky patch. GA-series 15 guitar amp (15W). Bolt 60 tube guitar amp. PA150/80 stereo mixing amp. Cube 60 bass guitar amp. VX120A vocal mixer. CE2 chorus. DR55 rhythm machine. NF1 noise gate. PD1 Rocker distortion. PW1 Rocker wah. SG1 Slow Gear. RE150 Space Echo. SBF325 stereo flanger. SDD320 Dimension D. SIP300 guitar preamp. SIP301 bass guitar preamp. SPA120 stereo power amplifier. SPA240 stereo power amplifier. SPV355 PV synth. SVC350 vocoder. SH2 monosynth. System 100M modular synth. VP330 vocoder. It's a reflection of Roland's remarkable progress in the seven years following their foundation that there's insufficient room here to discuss some of the important products that the company launched in 1979. On another day, the SH2, a super little dual-oscillator monosynth, would deserve more respect, as would numerous Boss pedals, the innovative SPV355 synth (which was in some ways a Promars without a keyboard) and the superb SBF325 flanger/chorus/doubler. We even have to skip over the highly affordable Boss Dr Rhythm DR55, the first handheld unit that allowed you to program, arrange, store and recall your own 12- and 16- step patterns, and there's no space to discuss the microprocessor controlled CSQ100, a 168-step single channel CV/Gate sequencer developed from the MC8 Micro Composer. Sure, there was a turkey, too... the VK1 combo organ was truly horrible. But such failures were rare, and there were three products in 1979 that we simply can't overlook. These are the System 100M modular synthesizer, the VP330 Vocoder Plus and, of course, the most famous of all Roland effects, the SDD320 'Dimension D'. Not to be confused with the earlier System 100, the System 100M was a superb modular synth, far neater than the American monstrosities that hung over from the late 1960s and early 1970s, and it garnered passionate devotees who would attempt to cover entire walls with its small but powerful modules. These modules could be housed in two sizes of frame — the '190' three-module rack, and the '191J' five-module rack — which also provided power to the '180', '181' and later the '184' keyboards, as well as to internal keyboard CV, gate and trigger lines, which considerably simplified patching. The list of modules was impressive (see the box below), with combined units such as the '110' VCO/VCF/VCA that made it possible to create complete voices in very little space. In fact, you could even create a basic four-voice polyphonic synth with just a 191J rack, four 110s, a '131' output mixer, and the four-voice '184' keyboard. Add a second rack stuffed with '140' LFOs and dual envelope generators, and you had an instrument much like the larger, heavier, more expensive, but far less stable Oberheim Four Voice. There were originally just six modules in the series, with a further four released over the next five years. Despite plans for a further nine modules, Roland shelved plans for five of these, and a final four — the 141, 165, 173 and 174 — appeared just before the company deleted the range five years later. A complete System 100M setup (shown above), as seen in a contemporary brochure, with the 184 controller keyboard at the heart of the system. Less impressive at first sight, the VP330 Vocoder Plus made a far greater impression on popular music. There were two revisions; the first with large, friendly rocker switches to activate the voices, the second with LED 'momentary' switches, although both sported the same four-octave keyboard, and offered the same selection of sliders and knobs to control the instrument's three sections. The Vocoder section offered 10 frequency bands plus a blue-noise sibilant generator, and maintained enough clarity for lyrics to be understood following treatment. This shared many features with the other sections — variable attack and release sliders, middle 'C' split point, Upper and Lower on/off controls, Vibrato and Ensemble — but whereas the Strings and Human Voice sections created their sounds by treating the internal oscillators, the Vocoder enabled players to modulate the oscillators with the input from a microphone. Even greater flexibility was provided by the External Synth input, which allowed you to 'vocode' any sound source. Widely adopted on its release, the VP330 has never fallen out of favour and — a quarter of a century later — it remains a highly sought-after cult instrument. The VP330 Vocoder Plus. If anything is to blame for 'talking synth'-style robot voices, it is this product. In contrast to the flexible VP330, the 2U rackmount Dimension D offered no controls other than selectors for its four preset chorus effects, some of which were so subtle that a few people claimed that they couldn't hear whether it was operating or not. But used correctly (which always meant in stereo) this was a hugely desirable unit, providing width and animation without imposing a new character upon the sounds it treated. Consequently, the 'D' became part of the standard equipment in top-quality recording studios and, today, the second-hand prices they command reflect the reverence in which they are still held. Despite the relative paucity of modules that exist for the System 100M, it has become one of the enduring modular synthesizers, and many are still used by aficionados worldwide. 110 VCO/VCF/VCA The basic synthesizer module, with internal connections that made monophonic (and, with multiple modules, polyphonic) synthesis practical. 112 Dual VCO Multiple CV inputs per oscillator, strong and weak sync, plus pulse-width modulation. 121 Dual VCF Three audio inputs, three CV inputs, and an integrated high-pass filter in each resonant, low-pass VCF. 130 Dual VCA Multiple, internally mixed CV inputs, and the ability to switch each VCA between linear and exponential response. 140 Dual envelope/LFO A dual ADSR contour generator, plus an LFO with delay and keyboard trigger sync. 150 Ring mod / noise / S&H/ LFO A versatile unit offering four modules in one, none of which were short on features. 131 Four-channel output mixer A stereo mixer with individual left/right panning for each channel, a headphone output, and a tuning reference oscillator. 132 Dual CV/audio mixer Another four-channel mixer, but monophonic. Designed to handle audio and control voltages. Offered positive and inverted outputs. 172 Phaser/delay/gate delay A powerful phaser/flanger module. Two of these, controlled using the external CV inputs, provided remarkable spatial effects. 182 Analogue sequencer A two-channel, eight-step sequencer with a 'series' mode for one-channel, 16-step operation. 165 Dual portamento Two, independent portamento controllers with voltage control of the slew rate. 173 Quad gate /multiple Connected and disconnected patch connections electronically, allowing users to reconfigure patches using control voltages. 174 Parametric EQ A single channel, four-band parametric EQ. 141 ??? One reference describes this as a VCO/VCF/VCA, while others suggest that it was a dual envelope generator, gate delay and inverter/adder. 170 External signal processor A combination of a pitch-to-voltage converter, an envelope follower, and an amplifier. PA250 stereo mixing amp. SMX880 mixer. VCA800 voltage-controlled amp. BF2 flanger. DM100 Delay Machine (analogue delay). DM300 Delay Machine. FA1 FET amp. PH1R phaser. PV1 Rocker Volume. RE501 Chorus Echo. SEQ315 stereo graphic EQ. SEQ331 graphic EQ. SPH323 phase-shifter. SRE555 Chorus Echo. GR300 guitar synth. G303 guitar controller. G808 guitar controller. G33 GR bass guitar controller. GR33B bass guitar synth. G88 GR bass guitar controller. EP09 61-key piano. RHYTHM PRODUCTS TR808 Rhythm Composer. CPE800 Compu Editor. CSQ600 mono sequencer. 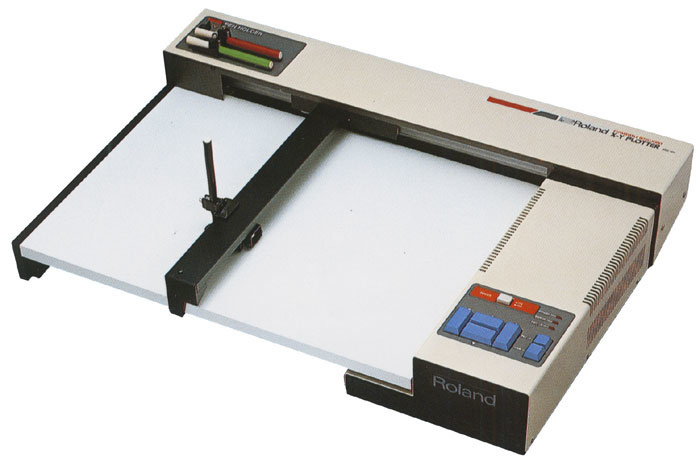 By the end of the 1970s, Roland were firmly established as major manufacturers. They had never cracked the top end of the synth market, but their Space Echoes, Boss effects, guitar synths, Jazz Chorus amplifiers, and 'CR' rhythm boxes were pre-eminent in their respective fields. The following year continued in much the same vein, although there were, perhaps, only two major products launched, neither of which caused much of a stir on their release. Nonetheless, both would become classics. I'm referring, of course, to the TR808 Rhythm Composer and the GR300 series of guitar synths. These days, it's a techno mainstay, but back in 1980, the TR808 was just another Roland drum machine, and was expected to be used on everything from rock to, well, 'Planet Rock'. 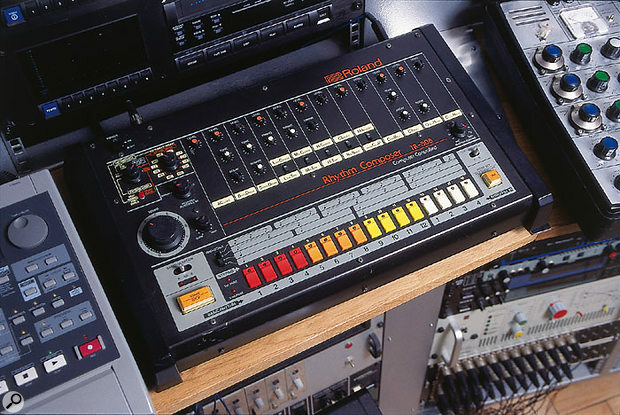 Despite its current place in history, the TR808 did not even warrant a mention in Roland's 25th Anniversary commemorative catalogue, published in 1997. As we now know, it was eventually to spawn a whole industry of clones and sample libraries, but its heyday began years after its short production run had ceased, at which point producers in the emerging house and techno genres discovered its unrealistic but compelling kick, snare and hi-hat sounds. The company later cashed in with digital recreations of the sound — the 'Grooveboxes' — but the TR808 itself was never the commercial success that its current popularity suggests. In 1980, it was merely Roland's latest drum machine, with 32 programmable patterns, a maximum of 768 measures, and 16 sounds that sounded nothing like the 'real thing'. Sure, it offered 12 independent outputs offering independent levels and tuning where appropriate, and was the first rhythm machine with non-volatile user-programmable pattern memories, but this wasn't enough to ensure its success against the existing Linn LM1 and the LinnDrum that emerged shortly thereafter. 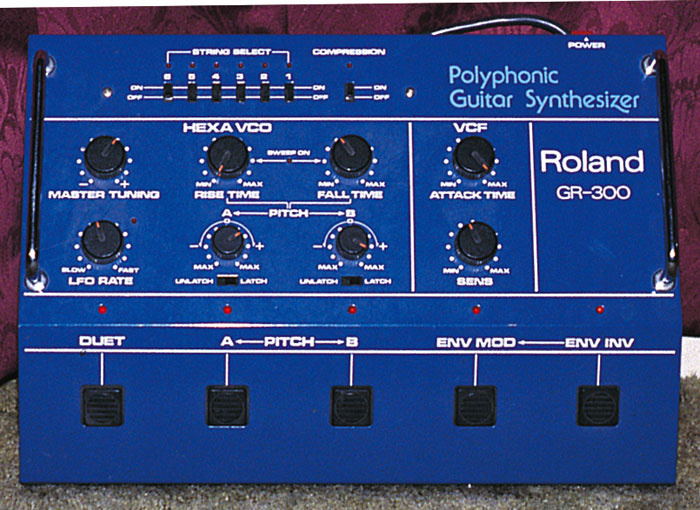 In contrast, Roland launched the GR300 with the strap-line, 'Roland invented the first true guitar synthesizer. Now, we've made it obsolete'. This wasn't strictly true... the previous GR500 and GS500 offered many features that the GR300 lacked, but in one way, it was correct. While the GS500's tracking had been at best 'iffy', the dedicated G303 (bolted-on neck) and G808 (through neck) controllers were far better, and they still offer perhaps the best tracking of all dedicated guitar synthesizers. The same accolade is also true of the bass guitar version, the GR33B, which had a slightly different voice structure and a choice of two controllers, the G33 and G88. The GR300 allowed you to decide which strings fed signals to the synth. Kakehashi viewed this as a natural stage in the evolution of the guitar, from its acoustic beginnings, through the rapid development of the electric guitar in the 1930s, '40s, '50s and '60s, to the next level, wherein each string can be treated as a separate instrument. Indeed, the GR300 featured a unique hexaphonic distortion that treated each string independently, which is very different from distorting the combined sound produced by all the strings. Sure, there was only a single filter in the GR300, and virtually no enveloping of the sounds, but the synth had an instantly recognisable character that elevated it to the status of an instrument in its own right. 1979's replacement for the original GR500 guitar synth, the GR300. The following year, Roland released two Fender-style controllers for the GR300, the G202 (with dual humbuckers) and the G505 (the most common GR300 controller, with three single-coil pickups and a tremolo arm). This was a good move because, like the GR500, the GR300 could only be controlled by Roland guitars with their dedicated multicore cables. However, unlike the GR500, you could also plug a quarter-inch jack into any of the '300' series guitars and basses, and play it as a conventional instrument. The GS202 guitar controller promoted (along with the G505) for use with the GR300.Surprisingly, Roland's reputation and enviable success did not guarantee financial stability. The Yen had been increasing in value from ¥310 to the US Dollar when Roland were established in 1972, to a temporary low of about ¥180 to the dollar in 1978/79. Although it recovered briefly in 1980, it was soon to rise in value again. Unfortunately, the strength of the Yen had a near-catastrophic effect on Roland, because their European distributor, Brodr Jorgensen, had been unable to cope with the increased cost of importing Japanese goods and, in 1980, they unexpectedly declared themselves bankrupt. This meant that Roland — who had themselves only just become cash-positive — suddenly found themselves without a European distributor, with one third of their worldwide business evaporating, and their European stock — millions of pounds of product — in the hands of Brodr Jorgensen's liquidators. Furthermore, $1,500,000 of unpaid product was in transit for Europe, and all this would be lost if Kakehashi could not move quickly. For the first time since establishing the company, he faced a crisis. And it was a huge one. Kakehashi immediately shut down all production of Roland products, and blocked delivery of the goods in transit. This didn't improve matters, but it stopped the situation from getting any worse. He then approached three banks for the credit necessary to continue trading, only one of which was prepared to help. Nevertheless, with a two-million dollar credit line from Daiwa Bank, the company was able to continue. In many ways, this couldn't have happened at a worse time, because during the course of 1980, Roland had been completing their gradual migration from Osaka to Hamamatsu, coping with all the problems and disruption that this must have entailed. Kakehashi himself spent the autumn and winter of 1980 criss-crossing Europe in an attempt to save his distribution network. By the time the new year arrived, Roland were at a crossroads. Although Roland were based in Hamamatsu by the early '80s, Kakehashi established the AMDEK Corporation in Osaka. Their main product lines were small effects units and computer monitors manufactured for Roland (but not by Roland) in Taiwan. For a couple of years, the company proved to be surprisingly successful but, as competition mounted, Kakehashi decided not to compete with the large computer companies entering the market, and in 1983 he ceased supplying monitors, simultaneously discontinuing the effects units. But this was not the end for the company. Kakehashi renamed it the 'Roland DG Corporation', and then used it as a vehicle to release a range of the company's own computer and music peripherals. CHK100 chorus. CMK100 compressor. DMK100 delay. DMK200 delay. DSK100 distortion. FLK100 flanger. GEK100 graphic EQ. OCK100 Octaver. PHK100 phaser. Cube 60 keyboard amp. Cube CK40 keyboard amp. MA15A micro monitor wedges. MS100A monitor speaker wedges. RM1200 console mixer. RM1200B console mixer. RM1600B console mixer. CS2 Compression Sustainer. DM2 delay. FV100 volume pedal. FV200 volume pedal. GE7 EQ. SD1 Super Over Drive. GR100 electric guitar unit. SDE2000 digital delay. HP60 electronic piano. HP70 electronic piano. CR5000 CompuRhythm. CR8000 CompuRhythm. TR606 Drumatix. Jupiter 8 (JP8) polysynth. TB303 Programmable Bass Line. In early 1981, Kakehashi was invited to rescue Brodr Jorgensen, but the scale of its debts to other manufacturers made this impossible. However, he managed to repossess the huge inventory of Roland products held by Brodr Jorgensen's liquidators, thereby stopping the world market from being flooded by cheap equipment that would have undercut Roland's own sales. Simultaneously, he was filling the hole left by his distributor's demise. Building upon the joint-venture model he had already established elsewhere, he opened four new companies in the space of just three months. Roland UK opened their doors in January 1981, as did Roland GmbH (Germany), followed in March by Roland Scandinavia and Musitronic AG in Switzerland. Remarkably, Kakehashi also found the time to establish a new Japanese division, which he opened in May 1981. Called AMDEK (Analogue Music Digital Electronics Kits) this was a conduit through which Roland would market and sell Taiwanese products to its worldwide distribution network (see the above box). The TB303 and TR606 were clearly designed to be used together, as can be seen from their physical resemblence. But one went on to defy all expectations and become the sonic heart of thousands of dance classics, years after the deletion of the product, while the other is a now largely forgotten drum machine. So, having averted disaster, the company was able to face the future with something approaching confidence. Nonetheless, there must have been some point in 1981 when Kakehashi wondered if he had lost the magic touch. 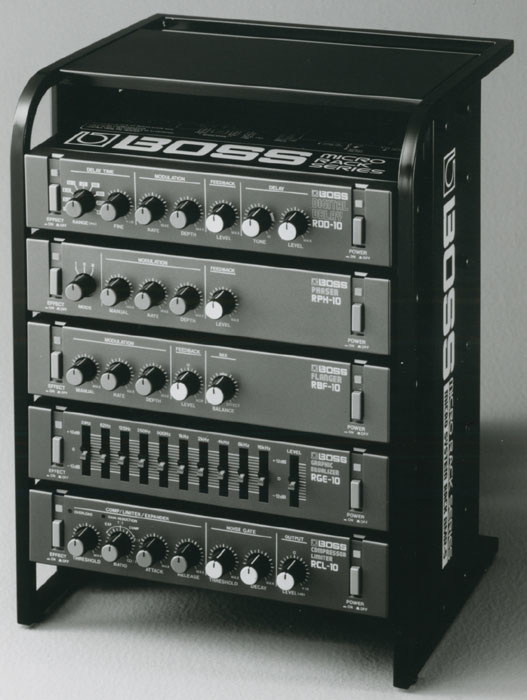 Roland and Boss launched more than 30 significant products during the course of the year yet, despite critical success, few seemed to catch the public's eye. Take, for example, the company's first big, polyphonic synthesizer and its toy bass machine. The former made little impact, while the other was soon to end up in the bargain bins, sold off cheaply for whatever dealers could get for it. But hindsight is a wonderful thing, as was Kakehashi's belief in his company and its designs. The polysynth was the Jupiter 8 (see the box on the next page). 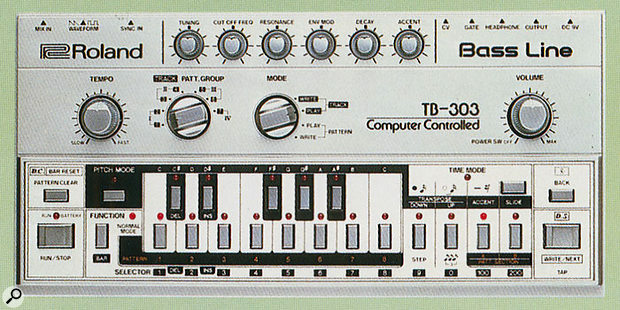 The toy was the TB303 Programmable Bass Line. Before 1981, Roland's incursions into the field of polyphonic synthesis could at best be described as 'tentative'. The Prophet 5 and Oberheim OB-series dominated, so perhaps it's not surprising that the original JP8 made little impact when it was launched. Today, of course, it's one of the most revered of all synthesizers, the icon against which all Roland's subsequent polysynths have been measured (and, for many aficionados, found wanting...). At the far opposite end of the scale, the TB303 seemed to have few redeeming features. Initially marketed as a 'computerised bass machine', it and its stable-mate, the TR606 'Drumatix', were intended for use as replacements for a bass guitarist and drummer, tasks at which they were singularly unsuccessful. It had a single, unremarkable oscillator, a primitive envelope, and few facilities other than a built-in sequencer. Had it not been adopted for the first acid house tracks later in the '80s, it's possible that the TB303 would have been no more than a footnote in Roland's product history. And why was it used...? Largely because it was cheap and easy to understand. Nowadays, of course, the TB303 is a staple of all types of dance music, able to chain user-programmed patterns into longer tracks, enlivened by Accent and Slide, and by the inevitable tweaks on its unusual resonant filter. Connected to a TR606 or TR808, or even the CR5000 and CR8000 CompuRhythm machines launched the same year, the TB303 produces an instantly recognisable sound that was eventually copied (with greater or lesser success) by almost every other synth manufacturer. There was even a fad in the mid-'90s for clones, with names such as MAB303, FB303, TBS303 and Tee Bee. The sincerest form of flattery indeed! The production run of the TB303 lasted less than two years, but it's rumoured that in this time Roland churned out nearly 20,000 of them, so it's likely that they'll be with us for some time to come. 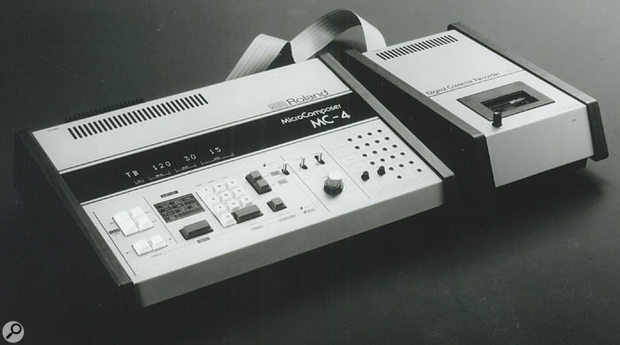 The last CV/Gate sequencer, the MC4, with its cassette tape backup recorder. Very 1981! Before moving on, two other products deserve mention. 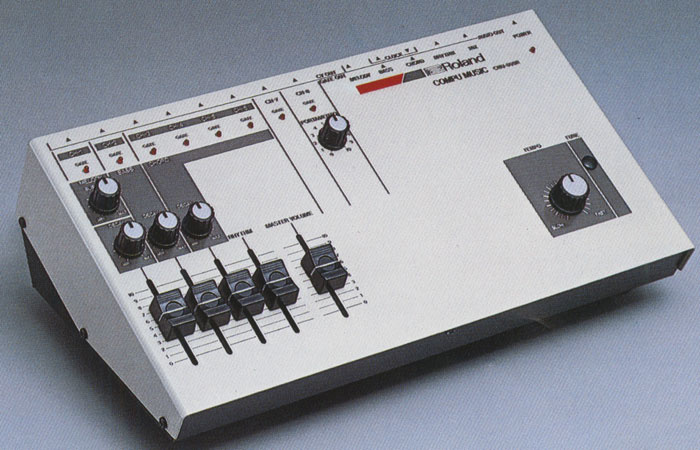 The first of these is the SDE2000, Roland's first digital effects unit. The other was the MC4 Micro Composer, which was to be both the peak and the end of the CV/Gate sequencing era. This was available in two models, the MC4A and MC4B, with an optional 32K memory expansion to upgrade the 'A' from 3900 notes to the 12,000 offered by the 'B'. Nowadays, the MC4 and its data-storage cassette recorder, the MTR100, look decidedly primitive, but for just a year or so, its bright LED screen, numeric keypad and the promise of true polyphonic sequencing made it an electro-pop star's dream machine. Unlike any other synth of its era, the Jupiter 8 didn't impose its own character upon a sound: if you wanted 'fat', you could have it; if you wanted ethereal, you could have that too. Indeed, the Jupiter 8 sounded as it looked — sleek and polished — in exactly the way that the competition didn't. Why this should have been so is one of life's little mysteries. After all, Sequential Circuits' Prophets, Oberheim's analogues and the Jupiter 8 all offered two VCOs per voice, a low-pass filter, a pair of ADSR envelope generators, and a range of modulation options. But there it was: Prophets and Oberheims were fat and imposing, whereas the Jupiter 8 could more easily complement other sounds without overpowering them. If you're looking for an example of a classic analogue polysynth, they don't come much better looking than the fabulous Jupiter 8. Furthermore, the Jupiter 8 bristled with features its competitors lacked. It had a split keyboard and numerous keyboard assignments, so that you could, for example, play unison lead lines above left-hand pads, or electric pianos above grunting bass lines. It offered oscillator sync, cross modulation, switchable 12dB-per-octave and 24dB-per-octave filtering, and polyphonic portamento. It saved and loaded voices reliably via its cassette interface, and it incorporated a superb arpeggiator. Finally, there was also a comprehensive complement of analogue interfaces that controlled the arpeggio speed, portamento, sustain, filter cutoff frequency, and the VCA. Add the CV and Gate outputs (with the pitch CV derived from the highest note played), and the result was an impressive package of features. What's more, the Jupiter 8 was more reliable than its competition, and its sound was more consistent from model to model, which made it very attractive for stage and studio use. 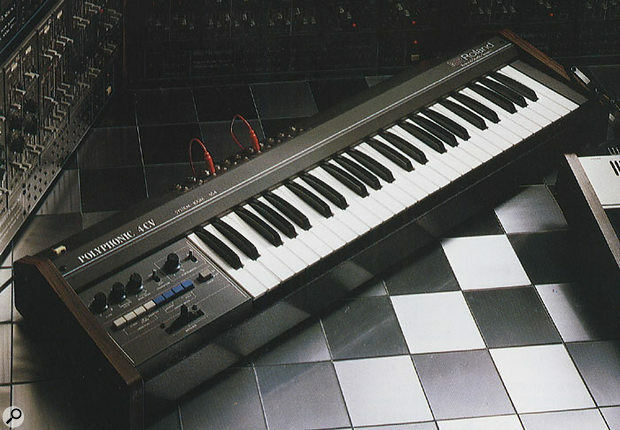 In 1982, Roland released an upgraded Jupiter 8, the JP8A, which offered a number of enhancements, including an improved DAC that increased the resolution of the auto-tuning system from 12- to 14-bit, plus a brighter LED screen. The electro-pop community was convinced: 'Relax', by Frankie Goes to Hollywood was dominated by a Jupiter 8, Nick Rhodes relied heavily upon his, and players such as Steve Luscombe (Blancmange), Vince Clarke (Erasure), John Foxx, and Martyn Ware (Heaven 17) were soon adopting it. The path to classic status began here. Bolt 30 tube guitar amp. CE3 Chorus. OC2 Octave. SCC700 SET Sound Control Centre. VB2 Vibrato. EP6060 dual-voice combo piano. HP30 electronic piano. Juno 6 polysynth. Juno 60 polysynth. Jupiter 8A polysynth. SH101 monosynth. Ikutaro Kakehashi worked tirelessly throughout 1981 to re-establish Roland's worldwide distribution channels and its financial stability, and no doubt Daiwa Bank were delighted to see that the company required only one third of the credit on offer. So, with their first major crisis behind them, Roland returned to their business plan, establishing yet another joint-venture company, this time in Belgium. It's not certain whether the slim range of products introduced in 1982 was a consequence of the previous year's difficulties (Kakehashi was, after all, one of the chief designers, and had spent much of the year travelling) or whether this would have happened anyway. There was the usual crop of Boss effects, another amplifier, the upgraded Jupiter 8, and a couple of instantly forgettable electronic pianos, but with just a handful of major launches, it's fortunate that the three new synths were to be amongst Roland's most successful products. They were the SH101, the Juno 6, and its almost immediate successor, the Juno 60. The Juno 6 was remarkable in many ways, but it did lack programmable memories. 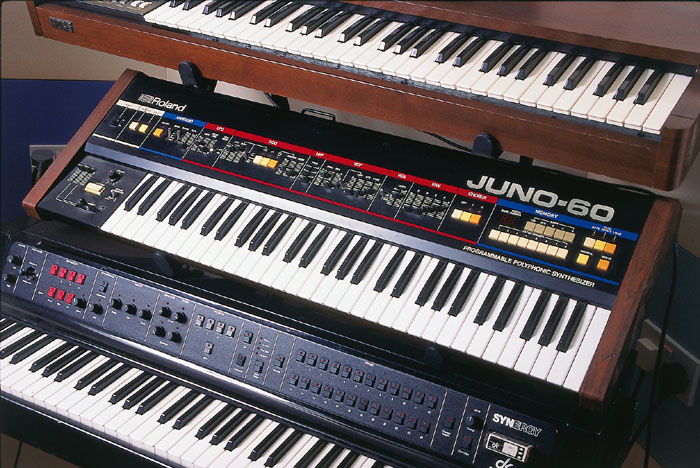 The Juno 60, launched soon thereafter, remedied this, and also offered a rear-panel DCB connector, Roland's first foray into digital interconnectivity (albeit a development rapidly surpassed by MIDI). To understand the background against which the Junos were released, it's important to know something about Frequency Modulation. This had been understood for decades, and by the middle of the 20th century, was employed as a means of broadcasting radio transmissions. It was not until the 1960s that John Chowning, a researcher at Stanford University, discovered that in addition to providing a means of carrying sound, FM could also generate audio timbres unobtainable by other means. Although the major thrust of his work lay elsewhere, Chowning continued to develop FM, and, in 1971, used it to synthesize conventional tones including organs and brass. Stanford subsequently approached a number of organ manufacturers with a view to licensing the technology. No American company showed interest, so Stanford turned to Yamaha. After a brief evaluation, they licensed the technology. It was not until 1981 that Yamaha unveiled their first commercial FM synthesizers. Named the GS1 and the GS2, these were monstrously expensive, but more affordable products soon followed in the shape of the CE20 and CE25, both of which were aimed at the home-keyboard market. Then, in 1982, Yamaha demonstrated an FM synth that you could edit. It was the progenitor of the DX7, and was to have a profound effect on all other synthesizer manufacturers. Kakehashi had known about Chowning's research long before the appearance of the DX7, and had met him at Stanford years before Yamaha's FM synths appeared. Unfortunately for Roland, this was six months after Yamaha had agreed an exclusive licence with the university. In his book, I Believe in Music, Kakehashi admits that Yamaha were the natural partners in this venture, because they had the resources to develop the chips needed to make FM synthesis commercially viable. Nonetheless, it's interesting to speculate what might have happened had Stanford turned to Roland after Hammond and Wurlitzer rejected their approaches. The GS1 and GS2 were highly respected, as were the contemporaneous Fairlight CMI and the Synclavier, so it was apparent to Kakehashi that digital sound generation was the way of the future. Unfortunately, Roland possessed no commercially viable digital technology. Furthermore, the metamorphosis of 'string machines' into primitive analogue polysynths had begun, and it was apparent that the days of large, expensive, analogue polysynths were numbered. Roland needed to make something affordable and polyphonic... something which included the magic word 'digital'. And they needed it quickly. Some of the pre-release marketing for the Juno 6 implied that Roland had fully embraced digital technology, but when the instrument appeared, it was clear that this was not the case. Everywhere you looked, there was traditional analogue technology... a VCF, VCA, an LFO and a single ADSR envelope generator per voice. The only suggestion of digital technology lay in its DCOs — its Digitally Controlled Oscillators. Today, DCOs are often derided when compared with VCOs, but this was not always the case. In 1981, the pitch stability of many VCOs left a lot to be desired, and their tuning was often temperature-dependent, so you could end up adjusting your synths many times during a gig or recording session. Not so annoying in the studio, this could be a significant shortcoming on stage. What we now regard as 'organic' was, in 1981, simply a pain in the posterior. It was, therefore, not just the sonic flexibility offered by early digital synths that appealed, but also their ultra-stable tuning. Unfortunately, not everybody could afford the digital technology of the day, so Roland developed the DCO; an analogue oscillator controlled by a digital circuit that ensured far greater tuning stability than was obtainable from VCOs. It seems incredible today, but the Juno 6 was the first analogue polysynth that you could carry onto a stage, switch on, and play with complete confidence that the instrument would be in tune. Moreover, it offered a good-quality keyboard, well-placed performance controls, a powerful arpeggiator, and Roland's classic ensemble. Oh yes... and it sounded superb and was excellent value. Roland had almost hit the bull's-eye. The only thing that the Juno 6 lacked was memories. Fortunately, less than a year later, the Juno 60 appeared. This was in most ways identical to its predecessor, but its top panel sported 18 chunky buttons that offered 56 patch memories plus the saving and loading facilities that went with them. Nevertheless, the most significant change lay elsewhere. To be precise, it lay on the back panel alongside the analogue inputs and outputs. It was the Digital Communications Buss (see the box below). Synth players everywhere slung it around their necks and used it for axe-replacement therapy, while others noodled one-finger Vince Clarke knock-offs on it in their bedrooms. 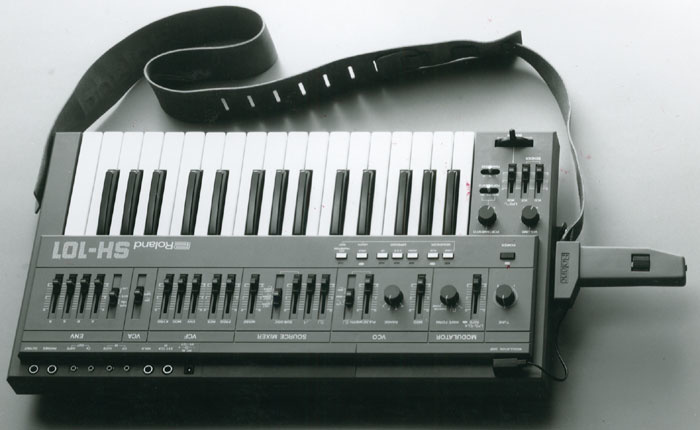 1981's SH101 monosynth was an instant classic, and is still popular today. Released the same year, the SH101 monosynth looked very much like a one-voice Juno 6. It lacked the polysynth's chorus, but gained portamento and a 100-step digital sequencer. 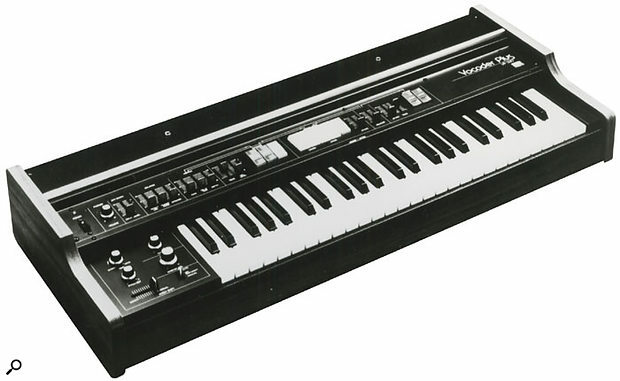 But unlike most of Roland's previous instruments, which were chunky affairs designed for use on tabletops and stands, much of the SH101 was constructed from high-density plastic, with the result that it was extremely light. Some players derided this, equating its weight to its sound, but this was foolish. The SH101 sounded excellent, and there was a good reason for its construction. Let's face it... the ability to run on batteries and the option of studs for affixing a guitar strap was a dead give-away. The SH101 was designed for posing. It was even available in three colours: grey, blue and red. With the optional MGS1 modulation grip — a stubby handle that provided LFO and pitch-bend controls — it became the de facto standard sling-on synth for the electro-pop crowd, and remains one of Roland's enduring successes to this day. Kakehashi realised that, alongside digital sound generation, connectivity was going to be a vital element in the future of music technology. So Roland developed the Digital Communications Buss (DCB), which first appeared on the Juno 60, shortly followed by the Jupiter 8A. The company even took care of the original Jupiter 8 by releasing a DCB add-on board, the OC8, which could be retrofitted to early models. 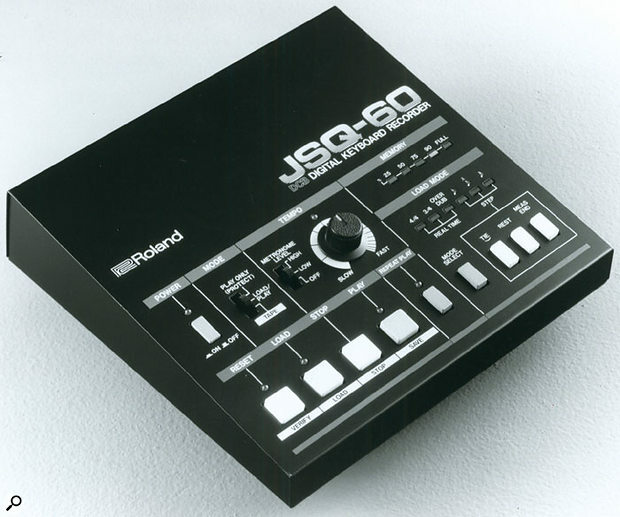 The company's first non-CV/Gate hardware sequencer, the JSQ60, was, as the name suggests, designed to interface with the Juno 60 via that synth's DCB connector. By making it possible for these synths to communicate with one another polyphonically (and, therefore, for players to play one from another) DCB was a huge step forward. DCB even allowed players to sequence the three synths using one of the latest generation of Micro Composers, such as the JSQ60. But if the standard had a limitation (and it had), it was that it was not a standard... It was a hardware and software protocol specific to Roland. As we now know, a cross-manufacturer communications standard was just a year away, and Roland were to be a major player in its development and implementation. However, the company never let down its DCB users, because another Roland product, the MD8, made it possible for DCB to talk to MIDI. Consequently, the Jupiter 8, Jupiter 8A and Juno 60 became three of the first analogue synths with MIDI communication capabilities, years before retrofits became available for many of their contemporaries. BN60 and BN100 amps. Spirit 10A guitar amp. Spirit 25A guitar amp. SQ40/60/100 guitar amps. SST120, SST80, SST60, SST40 speaker system. BX400 four-channel stereo mixer. BX600 six-channel stereo mixer. DD2 digital delay. DE200 digital delay. DR110 Dr Rhythm & Graphic. HA5 headphone amp (Play Bus). HM2 Heavy Metal. TU12 chromatic tuner. SDE1000 digital delay. SDE3000 digital delay. HP300 electronic piano. HP400 electronic piano. TDXY100R X/Y plotter. ADA200R A/D/A converter. CMU800R CompuMusic. CMU810 synth. Jupiter 6 polysynth. JX3P 'Programmable Preset Polyphonic' synth. 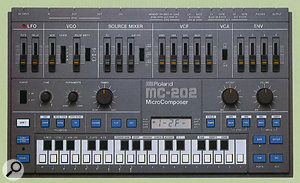 MC202 Micro Composer. MD8 MIDI/DCB interface. MM4 MIDI Thru box. In 1981, Ikutaro Kakehashi had suggested to Dave Smith of Sequential Circuits that they jointly develop a standard that would allow Roland and Sequential's synthesizers to talk to one another. Roland's 14-pin DCB scheme was not acceptable, because its connectors and cables would have been too expensive for a universal interface, and nor was Smith's two-pin serial interface deemed suitable because it exhibited serious limitations in complex setups. So, in 1982, a group of manufacturers that included Yamaha, Korg and Kawai formed a committee to develop a communications standard that could be common to all musical devices — synths, rhythm machines, sequencers, or anything else. They eventually adopted the five-pin DIN plug as the hardware interface, and by freely sharing information about the proposed standard, managed to interest other companies. Thus, in the autumn of 1982, they were able to announce the creation of a new communications system to be supported by the majority of hi-tech manufacturers. It was the Musical Instrument Digital Interface, or MIDI, and it was soon to change the nature of the entire music industry. A few months later, Sequential Circuits and Roland announced the world's first MIDI synths and demonstrated them talking to one another over a MIDI cable. Sequential's synth was a Prophet 600, but even Kakehashi is unclear as to which Roland was used, the JX3P or the Jupiter 6. Unfortunately, because neither press nor public attended this propitious moment, other reports are third-hand and inconclusive, although the consensus seems to be that the Roland end of the cable was inserted into a Jupiter 6. If Roland's R&D engineers had posed themselves the question of how they might improve on the Jupiter 8, they would not have designed the Jupiter 6. They would have increased the polyphony. They would have added velocity and aftertouch sensitivity. They would have reintroduced chorus and increased the number of outputs. And they would have added more sync and modulation options. But they didn't. Perversely, the Jupiter 6 offered a quarter less polyphony than its predecessor, had just one output, and replaced the Jupiter 8's proprietary oscillators with the same Curtis chips used by Moog, Sequential, and Oberheim. Had it been more affordable, it might have found a niche between the Juno 60 and the Jupiter 8, but it offered too little and was too expensive. The JX3P was a great synth, but was never a big success, as it was launched at the same time as the all-conquering Yamaha DX7. In 1983, Yamaha released the DX7. With 16-voice polyphony, velocity and aftertouch sensitivity, and bonuses such as provision for memory cartridges, this made Roland's synths seem decidedly 'old hat'. Moreover, at just £1500 in the UK, it cost a fraction of the price of a JP8 or JP6. Within weeks of the DX7's release, it was clear that the manufacturers of analogue synths had a problem. Indeed, those who derived their income solely from synthesizers were in trouble, and the DX7 was in no small way responsible for the eventual demise of Moog, Sequential Circuits and Oberheim. Fortunately, Kakehashi had anticipated this, and already curtailed development of the System 100M as well as production of lines such as the System 700 to concentrate on smaller, more affordable products. Furthermore, Roland had never been a one-trick pony and, not for the last time, this was when Kakehashi's foresight and the company's diversity really paid off. Roland had been world leaders in the effects market since the launch of the RE201, as well as in the fields of guitar amplifiers (the JC series), guitarists' 'stomp boxes', and rhythm machines. This meant that they could launch products in each of these fields and be unaffected by the advent of FM synthesis. What did someone buying a Boss phaser or one of Roland's flatbed X-Y plotters care about the DX7? Hang on a moment... X-Y plotters? Roland DG's DXY100R plotter, as seen on a 1983 flyer. On the left is the CMU 800R, which was included on the same brochure. Of course, no-one used these for musical purposes, as had been intended — but they paved the way for greater things. In the company's own words, "A computer by itself can do nothing", so Roland's engineers set about designing a family of peripherals that would enhance a personal computer's functionality. To appreciate this in context, you must remember that, in 1983, there were no PCs, Apple's flagship was the Apple III, and most computer enthusiasts used machines such as the Apple II, the Apple IIe, one of the Commodore PETs, or the Sharp MZ series. These were exciting and anarchic times for computer printers (relatively speaking, of course); no protocols other than the RS232 and Centronics communications standards were used to connect printers to the processor units. It was into these turbulent waters that Roland DG (the renamed AMDEK Corporation) launched their first four products. These were the DXY 100R plotter, the CMU 800R CompuMusic, the CMU810 monosynth, and the ADA 200R A-D-A converter (the first two of which are pictured above). The plotter was quite a breakthrough in its price/performance ratio, severely undercutting the Hewlett Packards that had previously dominated the market. But far from focussing purely on the engineering applications that were the raison d'être of plotters, Roland DG suggested that the DXY 100R could be used for scoring music. No doubt true in principle, this would have been a nightmare in practice, and I doubt that it was ever used in this way. One-finger synth-pop in a box. Clearly from the same design stable as the SH101, the MC202 offered sequencing facilities and a monosynth in a compact, fun-to-use package. Alongside this, the A-D-A was designed for industrial applications rather than digital audio, although the literature made it clear that Roland envisaged it being used as part of a music system. But with just eight-bit resolution, a maximum sample rate of 44kHz (not the 44.1kHz adopted for the CD standard the previous year) and harsh anti-aliasing filters that limited the bandwidth to much less than 16kHz, it was clearly not suitable for audio use. In retrospect, while none of Roland DG's first family of products was a huge success, they were all products of some remarkable forward-thinking. Think about it... a multitimbral module with digital oscillators, a digital converter, and a scoring plotter, all available as long ago as 1983. Their significance should not be underestimated. Before moving on, one more product from 1983 deserves mention. 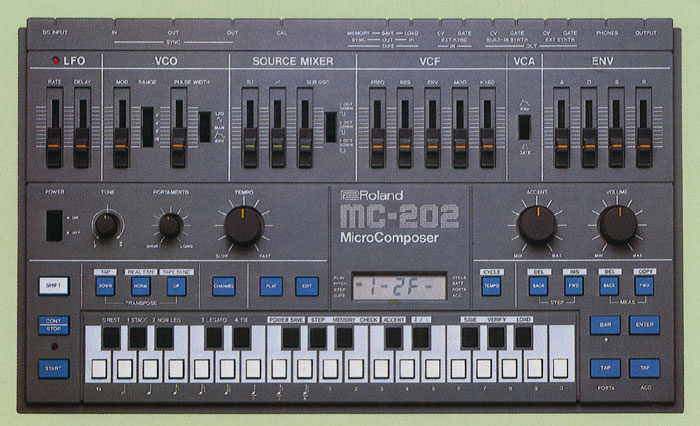 It's not the MC202 Micro Composer, which was a super little synthesizer/sequencer based on the SH101. Nor was it the SDE series of digital delays, which still attract a surprising following. It was the last of Roland's analogue drum machines. Or rather, the last Roland drum machine to include analogue sound generation. 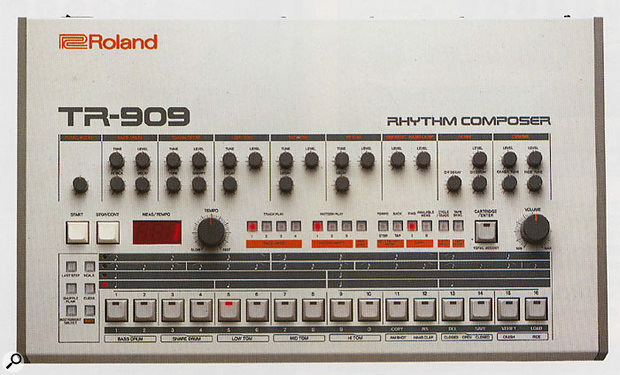 It was the analogue/digital hybrid, the TR909 Rhythm Composer. The first Roland rhythm composer to include samples alongside those classic analogue drum sounds, the TR909 became the drum machine for house music a few years after its 1983 release, mainly because it was so cheap by then! One of the first Roland instruments to be equipped with MIDI, the TR909 combined analogue sound generation of its drum sounds with digital samples for its cymbal and hi-hat sounds. With a powerful sequencer that let you chain 96 patterns into songs of up to 896 measures, numerous controls that let you tailor the sounds, and extras such as shuffle and flam, it undoubtedly sounded more realistic than its predecessors, and was moderately successful, even though the advent of purely sample-based drum modules would soon cause its demise. But, like the TR808 before it, nobody could have predicted the reverence in which the TR909 would eventually come to be held. Not all milestone products are hugely successful, as demonstrated by the CMU 800R, a small, wedge-shaped synthesizer built into the same case as the ADA 200R. But if any product can be said to be the ancestor of today's multitimbral rackmount modules, this is it. Originally manufactured in Taiwan in 1982 under the AMDEK name, this became a Roland DG product when Roland ceased marketing the AMDEK brand in 1983. It offered four sound generators; a monophonic lead synth, a monophonic bass synth, a four-voice polysynth, and a rhythm section with seven analogue drum sounds. Apart from level for each of the sections, little control over the sounds was provided — just decay rates for the tonal sounds, and a sustain level for the lead sound. What's more, the sounds were incredibly basic, being just digitally generated square waves, with no filtering or complex envelopes. Control was provided by sequencing software running on either an Apple II, a Sharp MX80, an NEC 8001 or, later on, a Commodore 64, and delivered by an interface card plus a dedicated multi-way cable. However, whereas the internal sounds did no justice to the control software, eight pairs of CVs and Gates on the back of the box allowed you to drive up to eight analogue monosynths using the CMU 800R as a secondary interface. At the same time, the module's clock input and output provided synchronisation with drum machines and other sequencers, and another box — the CMU802 CompuSync — added Sync 24 and tape sync. Another synth in the series, the CMU810, looked very similar but was a variation on the SH101 monosynth. Nowadays, its most unlikely that you will find a CMU 800R or a CMU802 in working order, not because the units have failed, but because they have became separated from their interface cards and software. Nonetheless, we should not overlook the CMU 800R. It was the first sound module to provide multitimbral voicing, independent outputs for each section, control over other synthesizers, and sequencing. As such, it occupies a unique and important place in history. Bass Super Cubes 40/60/100. JC120H Jazz Chorus Head. JC77 Jazz Chorus. Spirit 10A, 25A, 40A guitar amplifiers. SRA4800, SRA2400 and SRA1200. Super Cubes 40/60/100. BX800 eight-channel stereo mixer. CE300 Super Chorus. DB66 Dr Beat. DF2 Super Feedback & Distortion. DM3 Delay. DSD2 Digital Sampler/Delay. PH2 Super Phaser. G707 GR guitar controller. GR700 guitar synth unit. HP20 Piano Plus. HP350 Piano Plus. HP450 Piano Plus. MKS10 Planet P.
MRC APL, MCP APL MIDI composer/recorder software for Apple IIe. MRE IPC recorder for IBM PC. MSQ100 MIDI digital keyboard recorder. MSQ700 MIDI/DCB multitrack digital keyboard recorder. Juno 106 polysynth. JX8P polysynth. MKB1000 MIDI keyboard controller. MKB300 MIDI keyboard controller. MKS30 Planet S synth module. MKS80 Super Jupiter synth module. MPG80 programmer for MKS80. MPU401 MIDI processing unit. OP8M CV/MIDI interface for MC8. PG200 programmer for JX3P/MKS30/GR700. PG800 programmer for JX8P. SBX80 sync box. If Yamaha's dominance of the synthesizer market was causing Roland any harm, it didn't show in 1984. Roland's affordable analogue/digital hybrid synths were selling well, the company had passed the $100,000,000 turnover mark, and they were steaming ahead with a slew of superb releases in all its major product areas. Most significantly, there was the world's first system of controller keyboards and sound modules, the MKB and MKS series (see box below). There were also two superb new synths, the Juno 106 and, although few remember it as such today, the replacement for the Jupiter 8, the JX8P. Due to strong sales on its release, many Juno 106 synths are still in use in studios today. The Juno 106 looked quite different from its older brethren, and the changes were more than skin deep. Firstly, it offered a remarkable MIDI implementation that allowed players to record and sequence movements of the programming controls themselves. Secondly, the number of patches leapt from 56 to 128, and there was also the introduction of Roland's now-standard left/right/push performance lever for pitch-bend and modulation. Not everything was roses — the Juno 106 lost the Juno 60's arpeggiator and one or two minor programming capabilities — but Roland had hit the jackpot. At just £799 in the UK, the Juno 106 quickly became Roland's most popular product and it remains one of the best-selling synths of all time. The JX8P (also, apparently, a product of Roland's guitar-synth factory) was never destined for the same success and, although it was a far more powerful and flexible synth than the Juno, it lacked the same degree of mass-market appeal. In part, this was caused by Roland's eagerness to present their new flagship keyboard synth as competition for the DX7. However, this meant that it fell between two stools. Despite velocity and pressure sensitivity, and many factory presets containing the letters 'D' and 'X' in succession, it could never be as bright or responsive as an FM keyboard. Yet, by appearing to sacrifice some of the depth and richness of traditional analogue synthesis, it lost the allegiance of those who were looking to Roland to continue the Jupiter series. Furthermore, its six-voice polyphony looked horribly limited alongside the Yamaha. In retrospect, the relative failure of the JX8P is a shame. Together with its PG800 programmer, it was a flexible and accessible synth, and thanks to innovative little tricks such as the ability to link the volume of DCO2 to the keyboard velocity (which is particularly useful when the oscillators are sync'ed) it generated a wide range of new and powerful sounds. It also excelled at Roland's traditional strong suits — strings, brass and pads — and many of its factory presets have remained part of the standard synth vocabulary for the ensuing two decades. The G707 MIDI guitar controller — a product that could only have originated in the mid-1980s! The other product released by the guitar factory was a guitar synth that used the sound engine developed for the JX3P. This was the GR700, sonically a huge leap forward from the GR300, but hobbled by a tracking system that was inferior to that of the previous generation. To accompany this, there was also a new guitar controller. Lovingly (or perhaps not so lovingly) dubbed 'the Dalek's handbag', the G707 came in red, black and silver, and had an unusual body shape that was said to eliminate unwanted neck resonances. It also sported an unconventional stabiliser that ran from the body to the headstock and this, Roland claimed, eliminated dead spots and improved tracking. But despite the striking shape of the G707, and the vastly increased synthesis capabilities of the GR700, most players still lamented the passing of the GR300. In the field of Rhythm Composers, the big news was Roland's first all-digital unit, the TR707. Its large LCD made pattern programming easier than ever before, and pointed the way to all the grid-based drum machines and software programs that were to follow. In addition, thanks to its 15 PCM samples and velocity sensitivity over MIDI, it was arguably the most realistic drum machine yet released. You could even re-map the sounds to different MIDI note numbers; something that we now take for granted, but which was radical at the time. 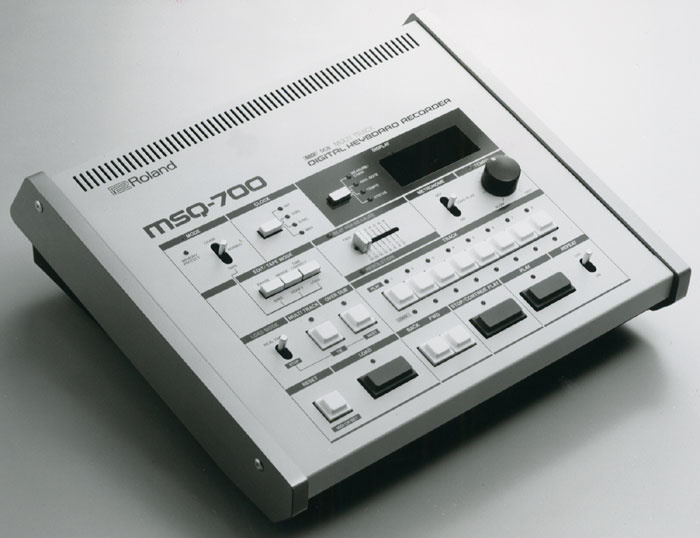 Roland's first MIDI sequencer, the MSQ700. Finally, I have to mention the MSQ700. The unmemorable name doesn't promise much, but in fact this was the world's first dedicated MIDI sequencer. In 1984, Roland pioneered a form of music production that we now take for granted, splitting the synthesizer into two parts: the world's first dedicated MIDI controller keyboards (the MKB1000 and MKB300) and a family of smart, 2U rackmount sound modules (the MKS10 Planet 'P' piano module, the MKS30 Planet 'S' synth module, and the MKS80 Super Jupiter synth module). The controllers were beautifully designed, differing only in the number of keys provided: 88 wooden, weighted keys on the former, and 76 semi-weighted synth-action keys on the latter. Both offered two zones, patch selection from 1 to 128, variable velocity sensitivity, transposition, pitch-bend and modulation, multiple MIDI Outs, and dual pedal inputs for the Upper and Lower zones. The only thing that they lacked was pressure sensitivity, but that hasn't stopped a handful of MKB1000s remaining in service to this day. The world's first MIDI piano module, the MKS10 was the baby of the rackmounts, in facilities if not in size and quality. With just 16 analogue sounds, divided into four each of piano, clavi, harpsichord and electric piano, it was enlivened by onboard chorus/flanging and tremolo effects. Two years before the arrival of truly realistic electronic piano sounds, it proved to be an interesting module, and one that still produces a small range of distinctive, and surprisingly useable, sounds. Once MIDI had provided a standard way to trigger and control synths thoroughly, there was nothing to to stop the controller-keyboard and sound-generating parts of synths being housed in separate products — hence the arrival in 1984 of, for example, the MKB300 master keyboard and the MKS30 MIDI module. Much more interesting was the MKS30, which was in essence a velocity-sensitive JX3P with an increased memory (an earlier version, the MKS3, was perhaps the world's first MIDI module, but never made it into production). Then there was the MKS80 Super Jupiter, the last and most powerful incarnation of the 'Jupiter' series. This delivered everything that the Jupiter 6 had not: velocity and pressure sensitivity, more memories, and improved modulation capabilities. There were eventually to be two incarnations of the MKS80, one using proprietary Roland voicing chips, the other with the CEM architecture of the Jupiter 6, so arguments have raged for nearly two decades about whether it was closer to being a souped-up version of the JP8 or the JP6. Ultimately, these arguments are pointless; the MKS80 was, and remains, a hugely desirable synth, especially when coupled to its dedicated MPG80 programmer, which gives every parameter a dedicated knob, button or slider. The MPG80 also transmitted all your twiddles as SysEx messages, thus making the MKS/MPG combination one of the first analogue synths (the other was the Juno 106) that allowed you to sequence parameter changes within a patch. Of course, more powerful master keyboards would soon appear, as would a host of sound modules from every synthesizer manufacturer. But the Roland MKB and MKS families led the way by being the first to separate the performance tools from the sound sources. DAC15X & DAC15 guitar amps. DC2 Dimension C. DSD2 digital sampler/delay. FV60 volume pedal. HF2 Hi Band Flanger. OD2 Turbo Over Drive. PCB4 power supply (Microrack range). RBF10 flanger (Microrack range). RCL10 compressor/limiter (Microrack range). RDD10 digital delay (Microrack range). RGE10 graphic EQ (Microrack range). RPH10 phaser (Microrack range). RPQ10 preamp/parametric EQ (Microrack range). SDE2500 digital delay. SRV2000 digital reverb. G77 bass guitar controller. GR77B bass guitar synth. EP50 combo piano. HP100 Piano Plus. DDR30 drum sound module. PAD8 Octapad. TR727 Latin Rhythm Composer. DXY880 A3 plotter. DXY980 A3 plotter. DPX2000 A2 plotter. Alpha Juno 1 polysynth. Alpha Juno 2 polysynth. AXIS1 Controller keyboard. EM101 Sound Plus module. HS60 Synth Plus 60. Juno 106S polysynth. MKB200 MIDI keyboard controller. MKS7 Super Quartet. MPU101 MIDI/CV converter. MPU103 filter/converter. MPU104 MIDI selector. MPU105 MIDI output selector. PG300 programmer. SBX10 sync box/converter. In 1985, Roland established their first joint-venture company for three years (in New Zealand), and Roland DG took their first independent steps towards becoming an international corporation in their own right by establishing their first joint venture, Roland DG Benelux. But as far as products were concerned, it was a year of evolution rather than revolution, as the company built upon existing product ranges rather than releasing radical new ones. For example, the Juno technology was re-used in four new products: the Juno 106S (a Juno 106 with speakers), the HS60 'Synth Plus' (which was also a Juno 106 with speakers! ), the EM101 desktop sound module, and the MKS7 rackmount module, of which more in the box on the far right. Likewise, the JX8P sound engine was recycled in a bass guitar synthesizer, the GR77B. This had its own controller, the G77, which also featured a stabiliser bar and was clearly a slightly larger partner to the G707 launched the previous year. Roland were also expanding their range of rhythm products. They had announced the previous year that they were entering the market for full-sized electronic drum kits, but development of these had clearly been slower than expected. When the PAD8 'Octapad' arrived, it was not a kit, but rather a single unit divided into eight sections, each of which transmitted a MIDI note number. The pads offered programmable velocity sensitivity, minimum velocity, and gate times, which appealed to 'real' drummers, and the Octapad soon became a fixture in the kits of the rich and famous. Unfortunately, the same could not be said of the DDR30 sound module that partnered it. Offering just four variations on each of six sounds — kick drum, snare drum, and four tom-toms — it was far too limited, and disappeared almost without trace. Elsewhere, there was another keyboard controller, the MKB200, Roland's first 'sling-on' MIDI keyboard controller, the AXIS1, plus a plethora of useful little MIDI boxes. 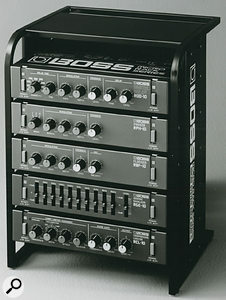 Originally part of the Boss stable, these first appeared as the Boss MI-10 MIDI/CV converter, the MI-30 filter/converter, the MI-40 MIDI selector, and the MI-50 output selector. However, once adopted by Roland, they became world-famous as the MPU101, MPU103, MPU104 and MPU105. Some of Boss's Microrack series of affordable studio problem-solvers. The format was a hit, and Boss returned several times to the half-rack idea over the years. Another Boss product range worthy of note, the Microrack series was a neat combination of half-width units that you could mount side-by-side on a dedicated tray, the RAP10, or in their own miniature rack, the BMR5. In addition to the PCB4 power supply, there were initially six units in the range. These offered compression, limiting, EQ, delay, phasing and flanging. Never as successful as the stomp boxes, these nonetheless spawned further series of half-width modules that became mainstays of the Boss range. Roland also showed their intention to compete at the upper end of the market for digital effects by releasing the SRV2000 reverb and the SDE2500 delay, which have remained popular to this day. But perhaps the biggest news of the year was the demise of the enormously successful Juno synthesizers and their replacement by two new low-cost keyboards, the Alpha Juno 1 and Juno 2. The Juno 1 was the baby of the pair, with a four-octave keyboard that was neither velocity nor pressure sensitive. 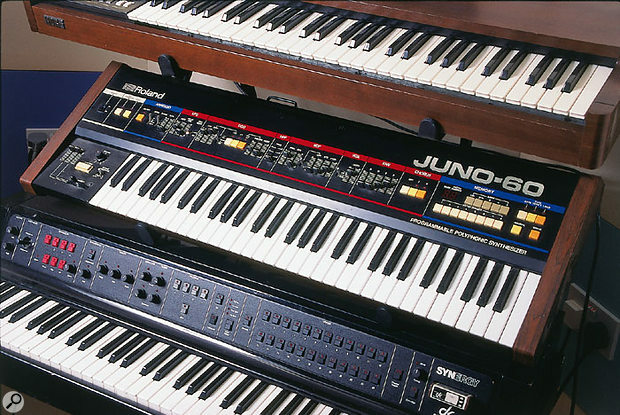 In contrast, the Juno 2 had a five-octave keyboard with both. Both models offered many improvements over the original Junos, with new programming and performance capabilities, backlit screens, an external programmer (the PG300) and, on the Juno 2, a cartridge slot for storing patches. Sonically, they were very different from their predecessors, with sophisticated DCOs that offered 14 basic waveforms including pulse-width modulation of both the pulse and sawtooth waves, and six sub-oscillator options. Many of these additional waveforms were harmonically complex, and they made possible timbres that sounded more 'digital' than any previous Roland synthesizer. Nevertheless, the Alphas retained the original Junos' ability to mix a pulse wave, a sawtooth and a sub-oscillator for lush 'analogue' sounds. Unfortunately, their filters were unable to self-oscillate, so several traditional Juno sounds became unobtainable. Nonetheless, both synths excelled at orchestral and string patches, brass ensembles, and pads. They also produced some remarkably useable lead patches, surprisingly good organs, a range of bright, percussive and FM-esque sounds, and some very fat basses. Overall, the Alphas were excellent packages, but the world appeared unmoved and, despite healthy sales, they were never held in as high regard as their predecessors. However, they did achieve something noteworthy. In March 1986, they were the first Roland products to be reviewed in a certain UK-based hi-tech music magazine, which had started publication five months earlier. Although Roland released numerous products in 1985, many of which remain popular well into the 21st century, their most significant product was probably one of the least known; the MKS7 'Super Quartet' rackmount module. An unassuming box supplied originally in black and soon after in ivory — in which form it was designed to match a PC case, and came without rack ears — this was almost certainly the world's first integrated, multitimbral MIDI sound module. OK, the Yamaha TX816 had appeared a year earlier, but this was a modular system comprising a case and space for up to eight TF1 synth modules. In contrast, the MKS7 was a single unit that offered four sections with independent outputs: a duophonic lead synth, a monophonic bass synth, and a four-voice polyphonic synth (hence the name... 2+1+4 = MKS7) plus a drum machine with 11 PCM sounds drawn from the TR707. If this specification looks familiar, it is. The MKS7 was a more powerful version of the CMU 800R. However, unlike the CMU, the MKS7 was useful, with 100 lead and polysynth sounds generated by the superb Juno 106 synthesis engine. The bass section drew upon a further 20 sounds produced by a subset of the Juno specification. There was even a 'Whole' mode that combined the almost identical lead and poly sections (the lead section included a noise generator that the poly section lacked) into a single six-voice polysynth, just like the Juno 106 itself. And, if you fancied a challenge, you could even attempt to play the 11 percussion sounds from combinations of the numeric keypad and the transpose button. The MKS7 was not just a preset machine, and although it offered no onboard sound storage, it had a voice buffer that you could edit using a Juno 106 or HS60, storing the results as SysEx on an external device. You could even edit it from the front panel in 'Engineering Mode', typing the parameter number on the numeric keypad and using one of the sliders to alter the value. But its real secret was velocity sensitivity. Both the VCF and VCA responded to MIDI Velocity, thus making the MKS7 the only 'dynamic' incarnation of the original Juno sound engine. Unfortunately, Roland never marketed the MKS7 as a professional synthesizer, relegating it to the role of a domestic or educational product. As a result, it was popular in schools and, in Japan, as a karaoke machine. However, amongst synth enthusiasts and the pro-audio community, it has remained largely unregarded since the day it was released. In 1979, Ikutaro Kakehashi published his own translation of a book called Synthesis, which had been written three years earlier by Herb Deutsch of Moog Music. At the time, Moog Music was still an icon of synthesizer design and manufacture, even though Bob Moog himself had left the company some years earlier. But, by 1985, Moog had gone out of business, whereas Kakehashi's Roland Corporation had struggled against a tide of digital synthesis to become and remain one of the dominant forces in synth manufacture. Nonetheless, it was obvious to everyone — customers included — that Roland could not maintain their position for much longer if they remained wedded to analogue technology. Inevitably, Ikutaro Kakehashi had recognised this long before, and the wheels had been turning in the research laboratories of Hamamatsu for some years. It was time for something new, and 1986 was to be a turning point for Roland, in terms of both its product lines and its corporate structure. It was also to mark the start of a golden age for the company, one that would last for half a decade until the recession of the early 1990s. So that's where we'll pick up the story in Part 3. In 1985, Roland DG moved from Osaka to Hamamatsu, and entered two decades of growth that would see it open subsidiaries in Belgium (1985), Australia (1988), the USA (1990), and the UK (2002). However, its products moved further and further from the music industry during that time; while you could argue that a small X/Y plotter could be used musically (for scoring) the same is not true for the larger DPX2000 plotter released that year. Nor is it true for the modelling machines, high-precision cutters, thermal-transfer printers, wide-format ink-jet printers, and 3D scanners that would appear over the ensuing years. Today, Roland DG is a significant corporation in its own right, listed on the Tokyo Stock Exchange, with numerous joint ventures and even a subsidiary of its own, the Modeling R Corporation, in Japan. But despite the Roland Corporation retaining approximately 66 percent of the shares in Roland DG, it had by 1986 diverged so far from Sound On Sound 's area of interest that we'll be saying no more about the company in this history.